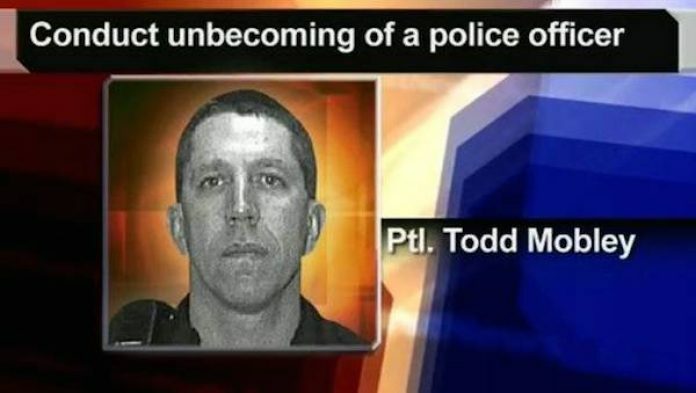 Todd Mobley, a police officer from Ohio, has been allowed to keep his job after being found guilty of attacking a couple at a traffic stop last November. He was found guilty of violating several department policies including use of force, unlawful search and seizure or detention, failing to control his temper and misuse of police cruiser dash camera. “As a result of that, there is a suspension that has been issued for 30 days and some other penalties attached in addition to that,” Niles Law Director Terry Dull said. The other penalties include forfeiting compensatory and vacation time and other leave in the amount of several thousand dollars. Lindsay Mulhull filed the complaint against Mobley. She said she is still shocked over the turn of events since she has known Mobley for the past 18 years. She said Mobley followed her and her boyfriend, Tom Huffman, home to Cherry Street and accused Huffman of stealing a gas can from the officer’s mother’s house. “He tells me to get my kids back. I turn my back and that is when he pushes Tommy up against the cop car by his shirt and presses up against his neck and says ‘you’re dead if I ever catch you around my mother’s house again. I will kill you.’ And he just keeps repeating ‘You’re dead. You’re dead.’,” Mulhull said. According to the police report, another officer arrived and Officer Mobley instructed him to shut off his dash camera, claiming it was for a legitimate law enforcement purpose, when it was for the sole purpose of not wanting his words recorded while threatening Huffman. He needs to learn that you swore in to be a police officer to serve and protect and to use the uniform as your own personal means of handling things is not something they are supposed to stand for,” Mulhull said. Mobley is back on the job after already serving his suspension. There will not be any criminal charges at this time.